As the chorus for an early construction of a Ram temple in Ayodhya grows ahead of next year's parliamentary election, many residents say the disputed site should be turned into a playground for children, and not politicians. Tired of living under the restive shadow of communalism, Ayodhya residents, be it Vijay Singh or Mohammad Azim, do not want any fresh political trigger for communal disharmony. Vijay Singh, a doctor who lives near the Ram Janmabhoomi, is a devout Hindu but he says he is not in favour of building a temple there if it leads ti acrimony between two communities. The 48-year-old medic says he was present in Ayodhya on the fateful day of December 6, 1992 when Babri Masjid was demolished by right-wing activists and has seen the riots that ensued in the holy city. "People of Ayodhya have lived peacefully and in communal harmony for ages, but politicians stoke the fire to suit their agenda. Even in 1992, so many people had come from outside to bring the structure (mosque) down. It was a very tragic and unfortunate incident that affects Ayodhya till this day," Singh said. Like most of the people in the city, Singh is an avowed devotee of Lord Ram, and the iron gates of his clinic, neighbouring 'Sugriv Kila', displays the chant 'Jai Shri Ram' in Hindi. On way to the Ram Janmabhoomi, underneath a tree, he and his wife run a makeshift counter to offer medical help to devotees. "We all have faith in Lord Ram, and I personally have no issue with a temple being built there, but if it leads to acrimony between two communities, then I am not in favour of it. Instead, I feel, the disputed site should be turned into a playground, where children of all faith can play together," Singh told PTI. The chorus for early construction of the Ram temple at the disputed site has been growing in the party and the Sangh Parivar. Ayodhya native Vivek Tripathi, who worked as a software engineer in several parts of the country as well as abroad, was in town to attend the 'Deepotsav' celebrations with his family. He recalls the horrible memories of 1992 when he was a school kid. "I was living in Bhopal those days, and after the riots broke out in Ayodhya, it affected our city (Bhopal) too as it did in other parts of India. We were present in school when it was shut suddenly, and I had to run back home taking alleys and bylanes, avoiding the route I would generally take as it wasn't safe then," Tripathi told PTI. The software professional, whose last assignment was in Italy, has taken to permaculture farming practice in Himachal Pradesh, said he only understood the scale of the tragedy when "I grew up and read about the case". "I do not understand this temple-mosque rift. Why we are trying to revive an issue that might trigger something unpleasant. Communal harmony is important, and we do not need to build anything there, we can just make it a playground for children and not a playground for politics," Tripathi said. Mohammad Azim, a 46-year-old resident of the city, who also bore the brunt of the 1992 tragedy, said, "Hindus and Muslims have always lived in peace here. They still do," and alleged, "politicians and outside elements, driven by an agenda, try to drive a wedge between the two communities for political gains." Ram Lochan, 45, a tarot card reader who puts up his shop near a tree on way to Ram Janmabhoomi, said, "I want a temple to be built, but a playground for children would also be fine. Ram Lalla, after all is the child avatar of Lord Ram." UP Chief Minister Adityanath visited the Ram Janambhomi on Diwali and offered prayers there. 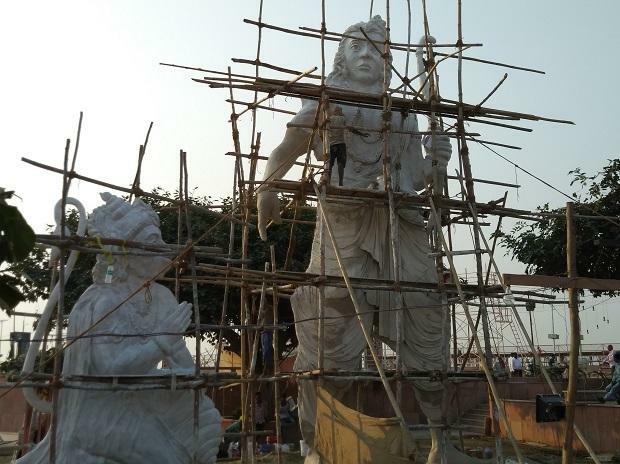 Currently, a statue of Ram Lalla (child avatar of Lord Ram) is kept at the site, which attracts devotees from far and wide, including Andhra Pradesh, Gujarat and West Bengal. A multi-layered security guards the heavily fortified zone while shopkeepers nearby sell religious artefact and merchandise, including a CD on 'Ayodhya Darshan' which has clips of the 1992 demolition incident, and a printed collage of photos which depicts an artist's rendition of a 'proposed Ram Temple'. A police official said about 20,000 people visited Ram Janmabhoomi on Diwali, almost double the footfall recorded on regular days. Aravind S and Vasanthi M, a couple from Eluru in Andhra Pradesh's West Godavari district, were among the devotees who visited Ram Janmabhoomi for the first time. "We both feel a Ram temple should be built here, it is the truth and a matter of our faith. But, people should go by the judgment of the Supreme Court," Aravind said. As many as 14 appeals have been filed against the 2010 High Court judgement that suggested that the 2.77 acres of disputed land be partitioned equally among three parties the Sunni Waqf Board, the Nirmohi Akhara and Ram Lalla.